Our winter birds include year-round residents and winter residents, northern visitors from sites as far north as the arctic tundra. 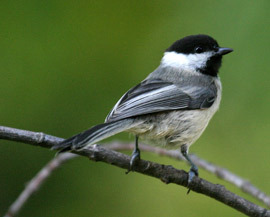 Year-round residents that frequent our woodlands, parks, yards and feeders include several woodpecker species, black-capped chickadee, white-breasted nuthatch, blue jay, American goldfinch, wild turkey and northern cardinal. Fields and roadsides may yield horned lark, red-tailed hawk or American kestrel. Bald eagles can usually be found along the Missouri and Platte Rivers. Regular northern visitors to our fields, roadsides and feeders include American tree sparrow and dark-eyed junco. A number of more unusual species occur in widely varying numbers from year to year. These "irregulars" are most commonly seen at area feeders. They include pine siskin, purple finch, evening grosbeak, common redpoll and red crossbill.